DENVER (AP) — As he rounded first base, Ryan McMahon turned back toward his teammates in the dugout, hollered and emphatically clapped twice. McMahon hit a two-run homer in the seventh inning after replacing injured slugger Nolan Arenado , Colorado’s beleaguered bullpen kept the Dodgers in check and the Rockies beat Los Angeles Dodgers 5-4 on Friday night. 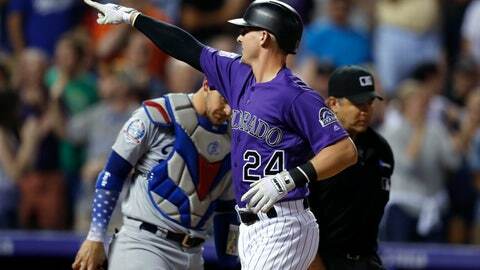 It was a rough night at the plate as well — the Rockies were 0 for 13 with runners in scoring position. But the bullpen was lights out a night after giving up five homers and seven runs. The relievers went a combined 3 1/3 scoreless innings after starter Jon Gray left, with Jake McGee (2-4) picking up the win and Adam Ottavino closing out the ninth instead of a struggling Wade Davis. It was Ottavino’s fifth save. “It was Mac’s night to give us a big swing,” Rockies manager Bud Black said. Dodgers: Closer Kenley Jansen was placed on the 10-day disabled list Friday because of an irregular heartbeat. MGR Dave Roberts didn’t have a timetable for his return. “I hit a home run against him in live BP,” McMahon said. In Jansen’s absence, Roberts said moving Maeda to bullpen remains a possibility. Maeda hasn’t discussed that with his manager yet. “It’s hard to say until we have that conversation,” Maeda said.